My spam flag for the answer below to a question Is the phrase 'request you to send the copy' correct? was marked as helpful. 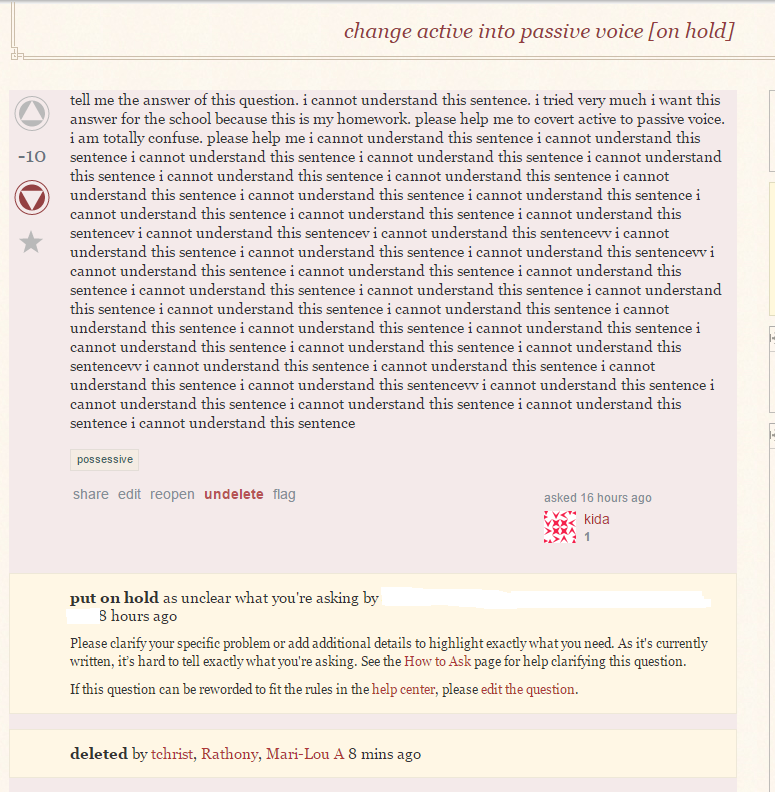 It seems that the post was deleted by spam votes, not by a moderator or any other delete votes. jijijijijnizhiwokodsa dengni ma? haha - It was the answer posted. The linked question change active into passive voice was posted 16 hours ago, closed 8 hours ago and just been deleted by voting. is it OK to flag it by clicking on "flag > spam"? 3 flags could have removed it from the front page and 6 flag votes could have deleted this post. Another question that (I think) should have been flagged. 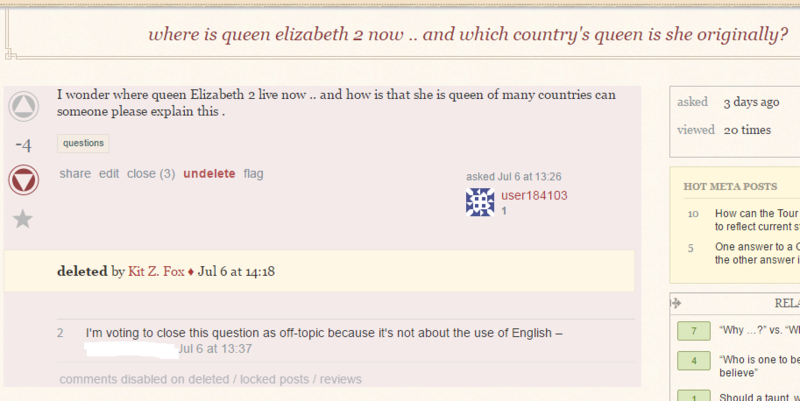 Where is queen elizabeth 2 now .. and which country's queen is she originally? Related Meta question: What are the spam and offensive flags, and how do they work?. The questions you've linked to are very low quality, worthy of being closed and deleted, but they aren't spam. Flagging them as spam would be not only technically incorrect, but also potentially detrimental as it would confuse the automatic spam detection filter. A reasonable person would find this content inappropriate for respectful discourse. ... but the second one is neither spam nor abusive, but should simply be closed as blatantly off-topic and then probably deleted. I think the argument in favour of flagging the “zombie wall of text” question as "spam" is that only 6 flags are needed for the post to be automatically deleted. That question is not your bog standard, very-low-quality, off-topic question. It's "junk", and to me junk = spam, the sooner it's dealt with, i.e. eliminated, the better. And someone must have flagged it as spam, (I did) because it looks spammy, and it is spammy because it is worthless. If flagging that single post as spam is going to tilt the automatic spam prevention system, (aka automatic spam detection filter) then the system is at fault, or needs fixing. I don't know. I would like to hear a mod's view on this. Was closing change active into passive voice as being unclear the correct procedure? Or should it have been flagged as abusive? I feel rather strange and sorry that we are debating the definition of "spam". The more important thing is discussing what we are going to do about it in the future, not whether it is SE policy or not. Is there a clear-cut polity at all on Stack Exchange regarding this issue? Where is "offensive" flag? The below image reads "This question was marked as spam or offensive". The linked answer (image below) to the question As my friend already introduced was posted an hour ago and it took only 49 minutes for three members to delete it. Do this answer and the first question (change active voice into passive voice) read abusive? Nah. What does it abuse? Do this answer and the first question read offensive? No. I am not offended. Do this answer and the first question read spammy? Yes. It reads like completely useless crap. The "spam" option should be changed to "spam and junk"
Another flag option could be created such as "gibberish" or "trollish"
Enable users with more than 20,000 reputation points to vote to delete it when it has a negative score in the same way the above answer was deleted by three votes as shown below. Is there a way to remove or edit a flag?